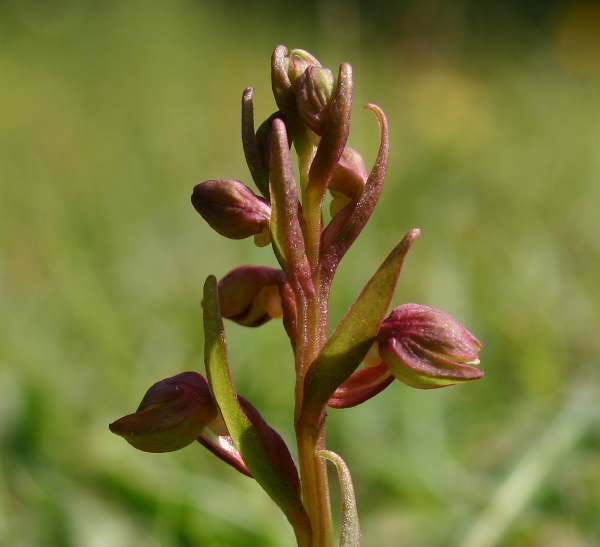 Formerly placed in its own genus, Coeloglossum,the Frog Orchid was reclassified following the discoverythat its genetic makeup is very similar to that of theSpotted-orchids and Marsh-orchids, with which it sometimeshybridises. Hard to spot on even closely cut or grazed turf due toits small size (normally 5 to 15 cm tall) the Frog Orchid'sflowers are supposed to resemble frogs. It depends on howvivid an imagination you have! This inconspicuous orchid has 3-5 dark green leaves. The leaves at the base of the plant are blunt but those occuring higher up the stem are narrow and pointed. The inflorescences of Frog Orchids vary considerably in size and carry between 5 and 25 individual flowers, which are green in parts and often a dark brownish-red in others. Dactylorhiza viridis is widespread throughout the UK and Ireland but its numbers are in steep decline due to habitat destruction and the ploughing up of so many of our ancient pastures. In Europe the Frog Orchid is suffering the same plight, but nevertheless it is still to be found from Scandinavia right down as far south as the mountain areas of Spain and Greece. In North Wales one or two plants have returned to the Anglesey Fens National Nature Reserves in recent years, and in 2014 they were also rediscovered at Minera Quarry near Wrexham, where they had not been seen for a very long time. 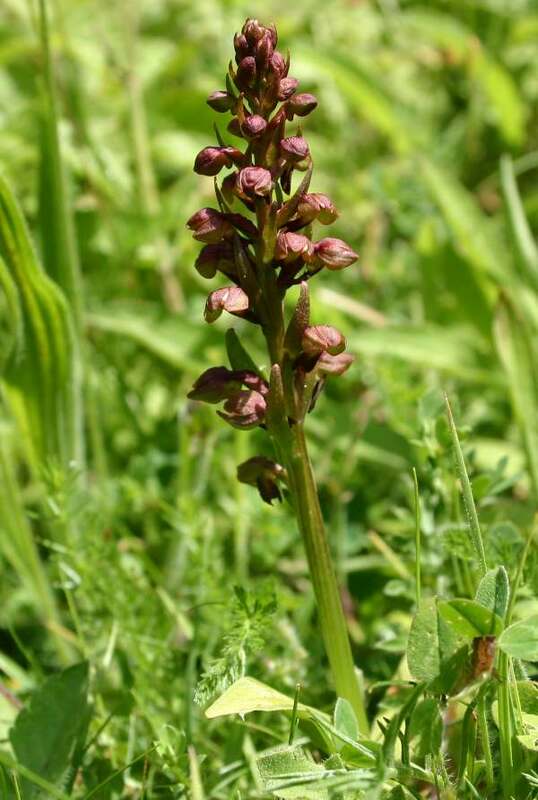 Ancient chalk grassland and meadows are the favoured habitat of the Frog Orchid. Although they can be very difficult to spot, in the best sites there can be thousands of plants which often go unnoticed. June and July are the best months to see the Frog Orchid. The specimens shown on this page were photographed in south-west Ireland and at Noar Hill in Hampshire in June.